As parents we expect a lot of our kids, but perhaps it isn’t our kids we are expecting a lot from. It’s us. I don’t know about you but I did not get a manual when I brought my first kid home. And it just got more complicated as we brought home more kids. I love my children, and I have taken parenting classes, read books, and I try so very hard to be perfect for them. But EVERY kid is different, and nothing can truly prepare you for it ALL. I recently came across this blog, A Mother Far From Home. It featured an article entitled “Why Am I an Angry Mom?” I never thought of myself as an angry mom. I do have a short temper, and I have very active and busy kids. So when it gets to be too much I have noticed — I yell. I had a Dad that yelled, and I remember flinching when he was mad. His voice was so loud and he seemed so mad I thought he was mad at me. It wasn’t until I yelled when my daughter dropped something in the kitchen (cheerios people, everywhere) and saw her flinch that I realized what I had viewed as my Dad being mad at me was just him being annoyed that there was more work to do. So I took a step back. And when I saw this article I realized that I wasn’t alone in my reactions. But perhaps, with a little help, I could find a new way to react. I’m not saying I am perfect now, and I am not saying you will be either. But I am saying it has helped me to recognize when I need to step back and react differently. I hope that it helps some of you too! 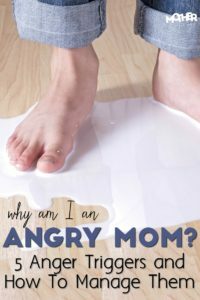 This entry was posted in Health, Learning and tagged a mother far from home, anger, anger triggers, dads, Health, kids, learning, moms, parenting, the boys store, yelling on April 28, 2018 by Lacy. We all love our kids. There is nothing we wouldn’t do for them. But as they get older it is more and more difficult to share our wisdom and knowledge with them. Especially in this age of technology when instant gratification is king. Our mom cards look very flimsy compared to what a friend saw on the internet. After all, if it’s on youtube it MUST be true. But the fact of the matter is, it usually isn’t. Life gets rocky when you hit those preteen years, and those come earlier and earlier now. But there are a few tips we can share that might prove to be very important. Keeping the communication open with our kids makes a difference. No matter what never shut down a conversation. Let them know that even if you do not know the answers, or if the subject makes you feel uncomfortable, you are there to help them. Because if they cannot come to us, they will go to the internet or a friend. And we all know that it will not end well. The internet is FOREVER. Make sure they understand that once it is on the internet or in writing, it is there, and you CANNOT take it back. We also are more willing to put things in writing that we would never say out loud. It’s the nature of text. In the “old days”, we wrote in diaries and journals. The written word gives us anonymity, it gives us strength, and it eliminates fear. It gives us the freedom to say things we would never admit out loud. So when you talk with your pre-teen make sure they know that if they wouldn’t say it to someones face, they shouldn’t write it down. If it isn’t something they would be willing to have handed back to them in 15 years and read in front of someone important to them (mom, dad, a spouse, their own kids, etc.) then it isn’t something they should write. Even though our friends may be cheering for us to do something and it feels like we are being validated for it, that applause and validation can be misleading. Even if someone is cheering you on the actions can still be wrong, harmful, or dangerous. Think about how you would feel if you did this in front of a parent, sibling, or grandparent. Would you still hear cheering if they were watching? Is this something you will be proud of when someone IMPORTANT hears about it? Labels are not permanent. You may be a popular kid, you may be a nerd, but those things are just momentary. They do not carry with you. They are not your identity. You will grow, you will change, the things that are cool now will not be in a few months or years. Everything grows, changes, and shifts. Try not to allow those labels change who you know you are. You may be good at sports now, but when you grow you may lose strength, you may have an injury. Those things will change how you play, how you interact. But they will not change how you treat people, how you learn, how you are motivated, or how hard you work. Do not let those labels make you feel small. They will not be around forever. Do not ever put someone else down. Everyone has their chance to be on top, and everyone has their chance to be on the bottom. The world is a giant spinning wheel. Remember when you are on the top who helped you get there, and who is currently below you. Because one day they wheel will spin and you will not have control over how they treat you. Treat everyone well and when the wheel spins you won’t be fearful of the bottom. This entry was posted in Learning and tagged high school, kids, learning, middle schoolers, mom advice, mom wisdom, parenting, preteens, talking with kids, teens, the boys store, tips on July 22, 2017 by Lacy.